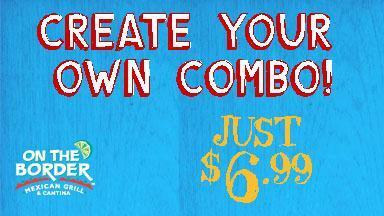 Create Your Own Combo, $6.99. All day-Every day! Click for free food. On The Border's festive atmosphere and top-notch margarita selection make it the perfect place in DFW for a fun night out with friends or a relaxed meal with the family. The food, ranging from traditional Mexican favorites to more inventive and lighter fare, is always fresh and affordable. The Create Your Own Combo is a budget-friendly highlight; you can mix and match two of your classic favorites, served with rice and beans, for under seven bucks. It's available lunch and dinner every single day. And their famous freshly made, bottomless chips and salsa are always on the house. The servers are laidback and friendly, just like the atmosphere. Their famous patio is always rockin' when the weather is nice, and indoors, you'll be treated to an eclectic mix of modern accents and lively music. A night at On The Border is always a casual, fun filled affair with a kick of Mexican flavor. No reviews were found for On The Border Mexican Grill.